Extra bolts are always needed to put up your favorite holds. These bolts are manufactured with Cold-Forging techniques which result in greater strength, higher fatigue resistance, and threads that last. 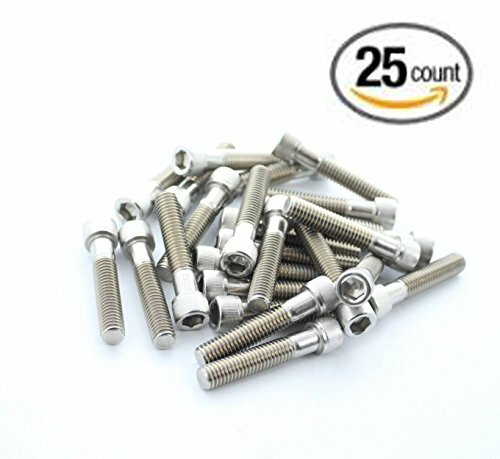 Using high quality bolts is a key factor in your t-nut life. 18-8: 300 series stainless steel having approximately (not exactly) 18% chromium and 8% nickel. The term "18-8" is used interchangeably to characterize fittings made of 302, 302HQ, 303, 304, 305, 384, XM7, and other variables of these grades with close chemical compositions. There is little overall difference in corrosion resistance among the "18-8" types, but slight differences in chemical composition do make certain grades more resistant than others do against particular chemicals or atmospheres. "18-8" has superior corrosion resistance to 400 series stainless, is generally nonmagnetic, and is hardenable only by cold working. If you have any questions about this product by Rizzo Sports, contact us by completing and submitting the form below. If you are looking for a specif part number, please include it with your message.